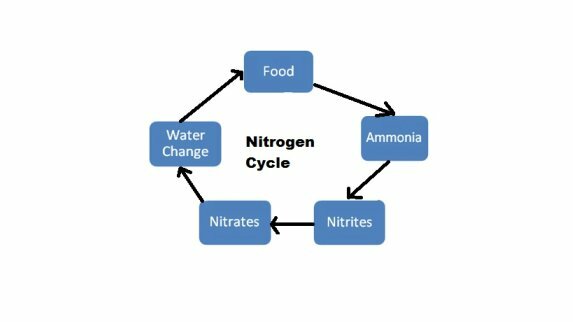 The fish tank cycle which is also often referred to as the nitrogen cycle is how the biological filtration deals with waste produced within the aquarium. Within an established aquarium there are lots of friendly bacteria working to convert ammonia produced by fish into less harmful nitrates. New aquariums do not have any friendly bacteria and therefore no biological filtration. As the fish keeper you need to start off the fish tank cycle and get it working properly. This is probably the thing new fish keepers struggle with most when starting this hobby. Unfortunately if you don’t get this part right and you won’t have the chance to find out what a wonderful hobby this is. As a new fish keeper you may be feeling very confused at this point, you may be wondering why you need to buy a filter if the aquarium grows its own biological filtration in the form of friendly bacteria. I’ll try and explain. There are three types of filtration working together within an aquarium, biological, mechanical and chemical. As I have already mentioned biological filtration relies on friendly bacteria, what you should all know is that many of the friendly bacteria live inside the filter. Most filters have some sort of foam sponge inside, otherwise referred to as filter media. The little holes in the foam sponge are not small enough to hold all the dirt passing through, they are designed that way to give the bacteria somewhere to live. Mechanical filtration works by physically trapping the waste partials within the filter media. Mechanical filtration is also performed by the foam with the filter; this is why you have to wash to filter media when you perform aquarium maintenance. Some filters also have a thinner cotton wool like layer which is designed to trap more dirt, these layers often require changing every time you clean the filter. Chemical filtration does not occur in every aquarium unlike the other two type of filtration. For chemical filtration to work there is normally an additional type of filter media added to the filter, most commonly used chemical filtration media is activated carbon. The downside of using activated carbon is that it neutralizes most aquarium treatments. So if your fish get sick and you have to put some medicine in the water, you have to take the filter apart and remove the carbon first. The diagram illustrates the different stages of the nitrogen cycle. More friendly bacteria convert the nitrites into nitrates. The nitrates are then removed during routine water changes. To start the cycle off a source of ammonia needs to be in the aquarium, the ammonia gives the bacteria something to convert and it also gives them a motivation to breed. There are four methods of starting a tank cycle that I have come across. Using filter media which already has living bacteria within it. To do this you will need a filter which been in use recently, therefore this method is not really applicable for new fish keepers who won’t have access to living filter media. This is a good method to use if you are up grading to a bigger tank. Adding a small amount of fish food each day. When the food decomposes it will release ammonia into the tank. You will need to keep adding food each day until the cycle process is complete. This was the method I used when I first started fish keeping and it works fine. Add pure ammonia to the aquarium. The amount needed will vary depending on size the of the aquarium, but you should make sure you add the same amount each day. I have not personally used this method, but it is currently very popular. You may struggle to get pure ammonia in some places. My advice would be if it’s not a product designed for the aquarium, don’t put it in the aquarium. Add one very hardy fish. This is perhaps the most dangerous method of cycling an aquarium, you run the risk of the fish dying if the process goes wrong. The last time I had to start up an aquarium from scratch I used this method. My aquarium is 240 litres and the fish I used were 10 two week old guppy fry, they were so tiny. The very small size of the fish in comparison to the size of the tank meant the biological filtration was never overloaded and it grew at a natural rate as the fry grew. I would still advise beginners against using this method unless you have a large tank, at least 150 litres in size. Once you have added your source of ammonia, you will need to test your water every day and make it note of the results. You will need to test ammonia, nitrites and nitrates. You should notice the following things happen. Ammonia levels will go up for a while; there is no set time scale for this you just have to wait. Ammonia levels will start to drop and nitrite levels will start to go up. Nitrite levels will start to drop and nitrate level will go up. When your test results only show nitrate present in the water it is time do a water change and start adding fish. Do not assume because your tank has gone through the whole cycle process you can stop testing and not worry about new tank syndrome. New fish keepers think it is safe to add as many fish as they like after they have cycled the aquarium. Every time the amount of fish is increased the biological filtration will also have to increase, if you overload it by adding too many fish at once it could send the aquarium into new tank syndrome. It will take around six months for the aquarium to mature, so you need to keep testing your water regularly. There are two products I also keep in stock; these are API Melafix and Nutrafin Cycle . Melafix which is described on the bottle as an antibacterial fish remedy, I use it if my fish start looking sick, it never fails to perk them up. The second product Nutrafin Cycle, which contains beneficial bacteria, it gives the biological filtration a bit of a boost. They are both fairly expensive, but in my opinion they are worthwhile. There are of course similar products available from different suppliers and those may be a little cheaper.